I am now finishing up my fourth year back in Mudville, having come back to help care for my mom, and some of the moments we share from day to day are just so funny that I can't help but laugh. At the same time it is these very moments that make me feel just a bit sad having to watch my mom go through them. It is part of life though and we cope as best we can. There is no key hole on the inside, just a deadbolt. I am grinning like a Cheshire cat, speechless, just grinning. I reach past her and turn the deadbolt and let her out. I lock the door behind us as we leave and take her to her physical therapy session. Once I get to the office, I email my sister to relay the funny moment. The worst part about this whole situation is knowing full well that my mom, having to endure this natural aging process and the onset of forgetfulness and confusion, is now very vulnerable to my two less unscrupulous brothers who share her home with her. She may be sweet and kind and generous, but that doesn't mean that they won't use it to their advantage. How one would take advantage of the same little old lady who opens her home to you is beyond me. Another day and another adventure. Has it really been this long? Where have I been and what have I been doing to keep me from my duties for so long? Why such a substantial break in the posting of the pleasantries? Pull up a chair, grab a cold one, sit down and let me tell you all about it. Since the 1st of September of last year, we have seen my children come and go a few times, my mom travel to Florida to meet her sisters, an entire rugby season pass by, a complete bathroom remodel, a puppy pass and a new year start. 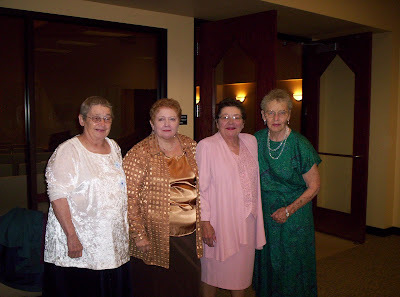 Mom met with her sisters up in Michigan for a wedding and again down in Florida for a week on the beach. That is (from left to right) Betty, Bridgit, Bonnie and Bubbles. Some sweet ladies. Wish I could hear the stories they have to tell. From growing up in the North, migrating to Texas, marrying and scattering, raising families and becoming empty- nesters and grandmothers; I'll bet they have loads of great memories to share. I have interviewed Betty once (to be posted still), and would love to interview the others as soon as I get the chance. However, geography works against me, in that regard. I am told that they had great visits at both locations, playing games, having a stiff drink and swapping laughs and memories well into the nights. Thanks to my incredible sister and my goofy brother for helping my mom get to see her sisters. On a more somber note, Rucker the puppy got out of the yard and wound up on the bad end of a collision with a car. He now rests under the front tree with my boy, Brutus. It made for a sad weekend, but life goes on and we have. He will be missed, though. The new bathroom looks great. Pictures of the process are in the works. And the rugby season has come and gone. The Bard sings about it elsewhere, but for now, suffice it to say, we went 3 and 7 and fared okay with plenty of room for improvement and some new faces. That's it for now. See you in a couple.